This season there are 54 new anime on the air, so it can be more than a little difficult to know which ones to watch. But now that the season has reached its half-way point, we at Kotaku East come bearing our recommendations. 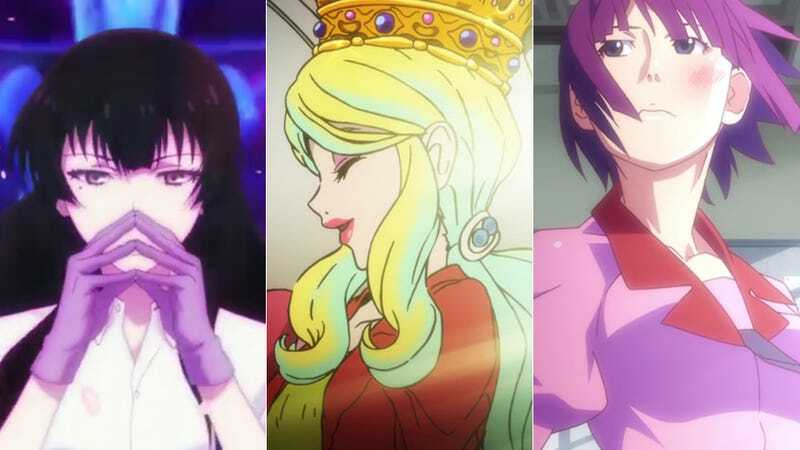 Fellow Kotaku author Toshi Nakamura and I have spent the past few weeks getting fully caught up on all the fall 2015 season’s most well-recommended anime (as well as several additional ones that just happened to catch our interest). And now with bleary eyes (but satiated minds) we offer forth the five you should definitely check out. Previously, we did a poll for this season’s most popular anime—so head on over there to see what everyone else is loving—but here are our five recommendations. And realize that your favorite show of this season might not be on this list (hello One-Punch Man! ), but hey, that’s the way it goes. Non-Spoiler Plot Summary: Sakurako is a genius beauty in her mid-twenties whose life is centered around one thing and one thing only: bones. With little tolerance for others, she would be completely isolated in her study full of skeletons if it weren’t for high school boy Shotaro—her new assistant and constant companion. Why exactly she has taken a shine to him remains a mystery, but one thing is clear: Whenever the two go out together, the chances are high that they will come across a human corpse. Why You Should Watch It: Beautiful Bones is an excellently built forensic crime drama. Most episodes have a single mystery—usually the two stumbling onto a murder—that is brought to a close by the time the credits begin to roll. Yet at the same time, the series has a single serialized mystery—a personal one instead of a criminal one—why has Sakurako let Shotaro into her life. It’s also beautifully animated with a dark color palette often offset with scenes of vibrant color. Especially notable is the series’ reoccurring scene where Sakurako reassembles the episode’s crime in her mind as if it were one of her skeletons. It is truly beautiful to behold. Watch It If You Like: Bones, Sherlock (or any other story of an anti-social genius solving crimes). Non-Spoiler Plot Summary: When Lupin III, the world’s greatest thief, gets married to a rich Italian debutante while in pursuit of his latest score, he finds that his new bride may be too much for even him to handle. Why You Should Watch It: This new series of Lupin III is a return to form for the decades old franchise. Set entirely in Italy, this anime guarantees a thrilling—and often comical—adventure in each and every episode. While all the old favorites return—Lupin, Fujiko, Goemon, Jigen, and Zenigata—the series’ new characters stand on their own. The most interesting of these is, of course, Rebecca Lupin, an adrenaline junkie who longs to face off against her husband in a dangerous test of skill. Also joining the cast is Agent Nix, an obvious James Bond knock-off with no qualms about using his License to Kill to take Lupin’s gang out of the game permanently. Best of all, with a planned 24 episodes, the series is happy to use some of its time on one-off character-piece episodes. Each one of these focuses on the main characters in solo adventures without the rest of the gang’s support—showing a side of them we don’t often see. Non-Spoiler Plot Summary: When the identical child sextuplets from popular 1960s gag-anime Osomatsu-kun get the opportunity to return to TV in 2015, they quickly realize that their 50-year-old jokes will no longer work. Thus, they try to become an anime that will be popular today—and end up being a series of skits following the sextuplets as deadbeat 20-somethings sponging off their aging mother and father. Why You Should Watch It: Outside of the first episode (which is an amazing extended parody of the most popular anime of the past 30 years), Mr. Osomatsu is an anime of fast-paced slapstick and nothing but. Jokes come so often that even if a few miss the mark for you, you’ll likely be laughing more often than not. Sometimes the jokes are situational comedy—like when one of thes brothers is kidnapped, only for the others to not really care. Other times the sketches are drawn out of popular culture—like an extended parody of the Saw horror franchise where Jigsaw can’t seem to grab the correct one of the sextuplets to torture. When it comes down to it, Mr. Osomatsu is basically a story of six terrible people constantly getting their comeuppance—and that, in and of itself, is pretty damn funny. Non-Spoiler Plot Summary: The god Yato has fallen on hard times and will do any job—from toilet scrubbing to babysitting—for a mere five yen. But once he was a god of calamity—an unstoppable god of destruction. And now, even though he has long since turned over a new leaf and has even gained a tight group of close friends, his old choices from so long ago have finally come back to haunt him. Why You Should Watch It: The first season of Noragami was all set up. It introduced us to the world while building the interpersonal relationships of the three leads: Yato; his living weapon, Yuki; and Hiyori, the human girl (whose soul has a bad habit of leaving its body) that they befriended. The second season is where everything really gets moving. It is all about the fallout from Yato’s past and how the three deal with being pawns in someone else’s grand evil plan. It also greatly fleshes out the world of the gods by showing the normal life of Bishamon, a powerful goddess with dozens of living weapons, as well as the unique problems she faces. It all makes for an exciting (and emotional) super-natural action anime. Non-Spoiler Plot Summary: Araragi is about the furthest thing from a normal high schooler you can imagine. He has fought demons and spirits—and even has a vampire living in his shadow. From his adventures he has gained both friends and a girlfriend and now leads a happy life despite the supernatural chaos he keeps getting entangled in. But all this never would have happened if it weren’t for a few key moments in his distant past that shaped him into the man he is—moments that he is now discovering ruined one girl’s life. Why You Should Watch It: The Monogatari franchise has had several anime series at this point, but Owarimonogatari is one of the best. It has the surreal art style and snappy comical dialogue that has become a trademark of the franchise as well as a strong theme that keeps the anime focused and, therefore, captivating. This time, the anime is about revisiting the past that shaped who you are—and realizing that what you thought was happening at the time was not even close to the reality of the situation. As the series progresses, we see how Araragi misinterpreted key moments in his life—which were likewise key moments in the life of his classmate Oikura. And while each event made his life better as a result, it only made hers worse and worse. The question is, now with hindsight, does the reality of what happened change who he is on a fundamental level? Also of note is that Owarimonogatari is a great starting point for those who have never seen any of the other 50+ episodes in the franchise as it deals with Araragi’s life before any of those events and speaks to who he is at the core as a person. If you like Owarimonogatari, then it’s safe to say you’ll enjoy the rest of the franchise. Now that you’ve read my recommendations for what anime you should be watching this fall season, you may wonder why your favorite series is absent. There are four potential reasons: (1) I think it is not up to snuff (or at least not quite as good as the five above); (2) it is the second/third/fourth season of an anime—and I haven’t seen the previous seasons; (3) it is an anime continuing from last season; or (4) it simply didn’t cross my radar. Oh, and if you feel the need for even more anime to watch, be sure to check out the five anime of the summer season you should have watched as well as our picks for the top five anime of 2014.